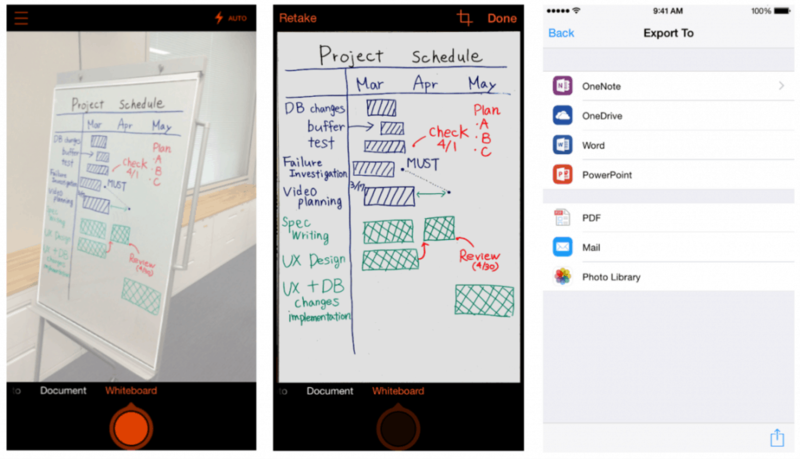 OneNote users have long been able to take a photo with their camera, clean it up automatically, and scan it into their notes, but that used to require the OneNote app itself. Now they can use Office Lens, a new scanning app which Microsoft released today for Android and iPhone (just over a year after it launched for Windows Phone). And since this app doesn't require OneNote for most features, so can you. The app lets users take photos of secret documents, business cards, dirty jokes, menus, risque notes, or whiteboards, and then use the app to crop, enhance, and upload the image to Office, OneDrive, or OneNote. The Scannable app for Evernote has similar features, but that app is also tied to Evernote while Office Lens functions at least somewhat independently of OneNote. Given that the scanning abilities aren't new or unique, I almost passed on reporting on this app. But what caught my eye was that Microsoft called the app Office Lens, and not Onenote Lens. That leads this blogger to wonder whether the app and some of the features will be spun off and pulled into Office 365, Microsoft's subscription-based office suite. Given what the app can do now, when it is still an iPhone-only beta release, I wouldn't be surprised. I've been playing with the app for a while this afternoon. I can report that the app offers 4 export options (Word, Powerpoint, OneNote, and OneDrive). You can also simply export an image as a PDF or email attachment. Taking a picture and exporting it as a PDF required no personal info, but I had to log in to my MS Live account to use the OCR features. So far as I could see I wasn't constrained into using OneNote, just some of its backend. I could be wrong, but in the long run I expect this will be an Office app, and not a OneNote app (even though it does depend on OneNote to function). It already has the name, and is halfway to being an Office app in terms of function. I wouldn't be surprised if the Office connection was emphasized in the first major update. Perhaps the app will gain a one-click OCR+Export to send a note to office 365? You can find the app in iTunes and on Google Plus (there's a beta community for the Android app). That is what I meant, thank you. It should be a part of the Office from the very beginning so I’m glad they’ll probably add in near future.